A Chef of Your Own cooked Christmas dinner in an All Star Vacation home. One of the hits for the evening was an appetizer served before dinner. This goes very nicely with crackers, for something extra special add a can of lump crab meat to the mixture. Awesome!! Combine all ingredients in a bowl. Pour into a large baking dish so there is a shallow layer of the mixture. Bake in a 375 degree oven 35-45 minutes until bubbly and golden. Serve with crackers. I just found this recipe on The Fresh Market’s web page. Preheat oven to 375°F. Melt 4 tbsp butter in saucepan over low heat; set aside. Grease baking sheet with remaining 1 tbsp butter. On a floured surface, unroll dough, cut into six equal squares, and transfer squares to baking sheet. Cover each square with apple slices, attractively overlapping, to blanket all but pastry edges. Using a basting brush or spoon, paint fruit with melted butter, then sprinkle each square with sugar and cinnamon. Place in preheated oven and bake 20 – 25 minutes, or until pastry is golden and fruit is tender. Serve with a drizzle of warmed caramel sauce and a scoop of ice cream. We used to do something similar at The Westin Hotel in Ft Lauderdale using a sugar cookie as a base and we made homemade Blueberry Goat Cheese ice cream, just let me know if you would like the recipe. Here is a cookie recipe close to the heart of A Chef of Your Own. Years ago when baking cookies for the holidays, my husband asked about these rum cookies that his mom had made. She didn’t remember them or have the recipe. I couldn’t find it in any of the 200? cook books I had either. Then one day, I got the September 1994 Preferred Client Newsletter from The Bradford Exchange. Imagine my surprise finding the recipe printed there. It was submitted by Gregory Cashier, IL. I hope you enjoy them as my family has since. Cream butter, add sugar and continue to beat until light. Add vanilla and flour. Mix well. Add in chopped nuts and liquor. Shape into small balls. Place balls on an ungreased cookie sheet. Bake at 350 degrees for 15-18 minutes. Roll in powered sugar while still hot. When cool, roll in powered sugar again. Makes about 3 dozen cookies. Tami, please let me know an address and I will get you out your cookies. Here are some more recipes from the Fresh Market Holiday entertaining ideas A Chef of Your Own will be making at the demo this Sunday from noon to three. * found in our Dairy department. This was probably the hit of the day! ball for presentation and extra flavor. cheese. Serve on TFM Organic Water Crackers. Here are a couple of other recipes A Chef of Your Own will be making at The Fresh Market demo tomorrow, Saturday the 4th, Dr Phillips. Please stop by from noon to three to try some of the samples. Crackers or TFM French Rounds. bowl; set aside. Heat a skillet over medium high heat for 2 minutes. and cooked prosciutto and serve. 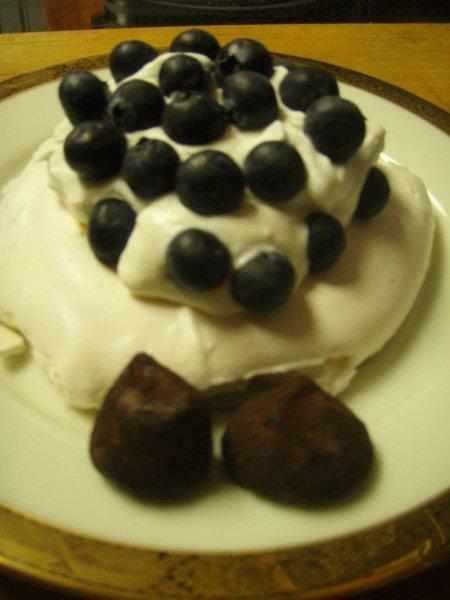 As promised to A Chef of Your Own clients, Sally and Chris, here is the Pavlova recipe from dinner the other night. I cooked in a Contempo Florida Homes, www.contempogroup.com. The first course was Caribbean Shrimp with Mango Salsa, the recipe can be found earlier on this blog. Dinner was herb crusted rib eye steaks with au gratin potatoes and dessert was Pavlova with fresh strawberries. I served dessert with a new wine out on the market, Chocolate wine, http://chocovine.com/welcome.htm, combining Dutch chocolate and Cabernet wine. I have tried Pavlova before but not with as much success, tender and crispy on the outside, creamy and chewy on the inside. Place rack in the middle of the oven and preheat to 275 degrees. Linda large baking sheet with parchment paper. Pour the vanilla into a small cup. Combine the cornstarch and sugar in a small bowl. In a large bowl fo a heavy-duty mixer, fitted with a whisk attachment, whip egg whites, cream of tartar and salt, starting on low, increasing incrementally to medium speed until soft peaks start to become visible, and the egg white bubbles are very small and uniform, about 2-3 minutes. Increase speed to medium-high, slowly and gradually sprinkling in the sugar-cornstarch mixture. A few minutes after these dry ingredients are added, slowly pour in the vanilla. Increase speed a bit and whip until meringue is glossy, and stiff peaks form when the whisk is lifted, about 4-5 minutes. Spoon the meringue into 8-10 large round mounds that are 3 inches wide on the lined baking sheet. With the back of a spoon, create an indentation in the middle of the mound for holding the filling once meringue is baked. Place baking sheet in the oven. Reduce the temperature to 250 degrees. Bake for 50-60 minutes, or until the meringues are crisp, dry to the touch on the outside, and white, not tan-colored or cracked. The interiors should have a marshmallow-like consistency.check on meringues at least once during the baking time.If they appear to be taking on color or cracking, reduce temperature 25 degrees, and turn pan around. After the hour baking, I turn the oven off, and leave the meringues in the oven to cool with the oven. Once cooled, will keep individually wrapped for up to a week if your house is not too humid. Serve topped with your favorite filling, lemon curd, raspberry or blueberry sauce and fresh whip cream.